Light the main lamp only, the display base only, or both at the same time. 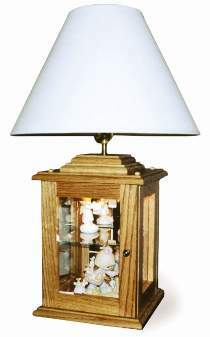 Wood base measures 15"H.Display Lamp Hardware Parts Package includes non-mortise hinges, knob, magnetic catch, 3-wire turn-knob socket, candelabra socket, 10" lamp harp, 8 foot cord set, 7-1/2 watt bulb and misc. lamp hardware. Project plan, glass, wood and wood finish are not included.